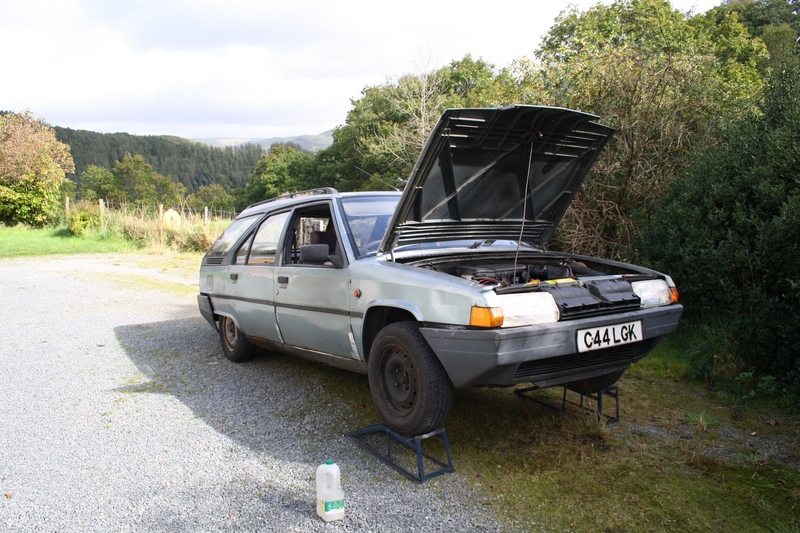 Citroen BX Cambelt Change – HubNut – celebrating the average! Changing a timing belt or cambelt was a first time experience for me. I’ve owned and worked on 2CVs for years, but they don’t have timing belts, radiators, water pumps or a transverse-mounted engine. That latter factor makes changing a timing belt on pretty much any modern car a big challenge. The end of the engine is inevitably jammed up against the inner wing making access tricky. This job rates quite highly on the Knuckle-scrape score. As you can see, there is about an inch of clearance between the end of the engine and the inner wing in the case of the BX. The timing belt runs through the top engine mount though, which means it has to be removed. That allows you to jack the engine up/down to get a little more clearance – vital if, as in this case, you also need to replace the water pump. You then lock the engine using a hideously difficult-to-locate hole in the engine to lock the flywheel, and three 8mm bolts locking the camshaft and diesel pump (two bolts here). 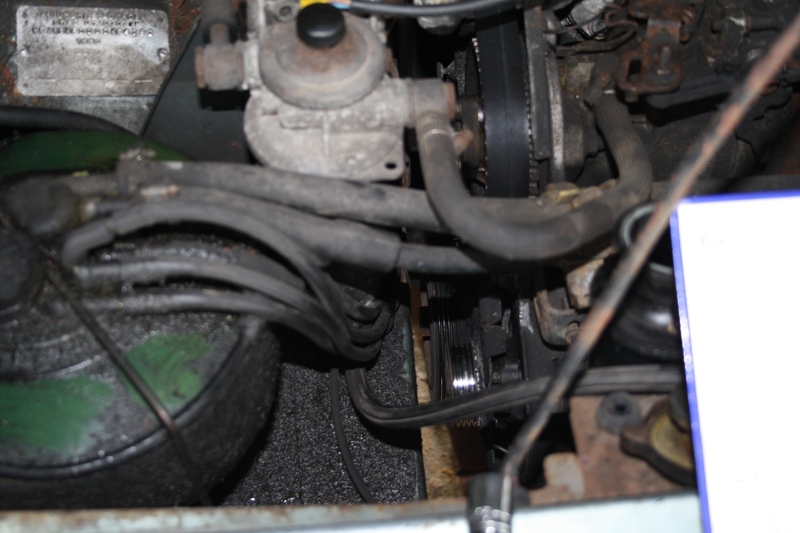 After that, removing the belt is fairly easy, though slackening the tensioner is very difficult. Access is poor and you can’t actually see the adjuster nut – you have to feel for it. I had to rope in a friend to push against the tensioner spring while I loosened then tightened the adjuster. Quite obvious which one is new! With the belt off, the water pump could be replaced. This was simply a case of unbolting it and removing it, though you do need to take time to carefully scrape away any remnants of gasket from the engine. 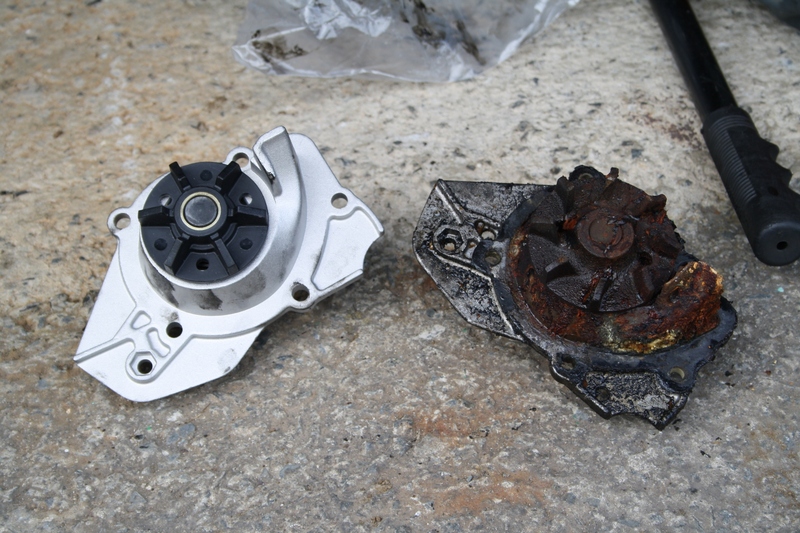 The impeller seemed slightly smaller on the new pump but asking around, this wasn’t thought to be a problem. It’s probably just a design change during the life of the vehicle. The pump was fitted and I could set about getting the new belt on. This is a bit fiddly, but an extra pair of hands from that trusty friend helped again. Make sure you re-fit the crankshaft pulley BEFORE turning the engine over, and also make sure you remove all of the bolts that lock the pulleys and crankshaft in place. We turned the engine over twice and attempted to refit all of the locking bolts. They all went in, suggesting everything was in the correct place. It was time to start the engine! Aside from a bit of smoke (the glow plugs are not healthy) she started up and ran smoothly. Excellent! We didn’t run her for long as I hadn’t yet added coolant. I was going to fit a new radiator fan switch but instead opted to use a coolant flush on the engine. I’ll change the fan switch when I drop this cleaning coolant later on. As you can see from the water pump picture, the waterways are clearly quite gunked up! Bleeding the cooling system can be a challenge. The trick is to ensure the heater is on and use ramps to ensure that the radiator is the highest point in the cooling system. This will encourage air towards the radiator. Squeezing the coolant pipes also helps, including the heater pipes. You must be VERY careful doing this on a BX as your arm gets very close to the hydraulic pump belt. Make sure your sleeves are rolled up! By squeezing the pipe and letting air out via the bleed screws on the thermostat and radiator, you should be able to get a nice, toasty heater and remove any air leaks. Do keep an eye on the coolant level at all times, as it will drop as you remove air and release the bleed screws. With the BX, you have rather a trust in faith as there is no temperature gauge. Where fitted, keep an eye on it during a test drive and hopefully that’s job done!